Sure, he looks innocent enough, but evil lurks inside! This all started earlier in the day when Nick mentioned he saw a billboard for a new Oreo Coolatta (and donut). As the official biggest fan of cookie & cream in the northeast, I immediately clicked over to the Dunkin Donuts website to see the newest creations first hand. 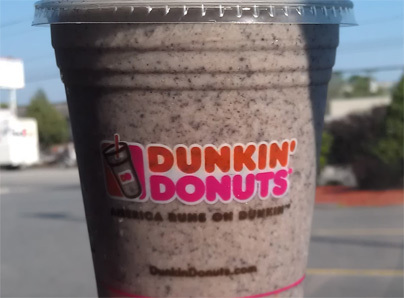 Not only does the Oreo Coolatta actually exist, but it comes in both Vanilla Bean and Coffee flavors. Wow, color me impressed DD. I debated how long I would wait to satisfy my curiosity about the new treat.... but then realized I should wait for dinner.... then I remembered I needed some gas.... which just happens to be next to a Dunkin Donuts.... it sure would be a shame to drive off without trying it.... oh yeah! There's a big poster in the window advertising the Oreo Coolatta. We're going in! I watch closely as my coolatta is made. 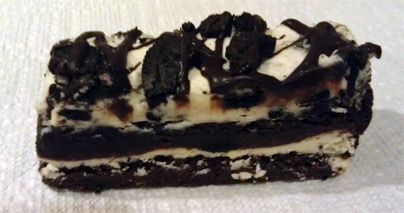 In goes a squirt of vanilla and then three huge squirts of oreo cream flavoring. Wow, that's an awful lot of cream in my cup. Then goes in at least 3 big scoops of Oreo cookie crumbs if not more. It gets blended up and handed to me. I take one more quick glance over at the Oreo donuts and head off to the car (they have both a standard hole donut and one that's filled). Oh was I excited to take that first slurp. Hmmm, interesting. The cream flavor is way more potent than expected. It's also kind of weird because I've had so many cookies and cream shakes that it's weird to have a similar flavor yet have it be so liquidy. I think I like it, so I continue on. With every sip, the cream flavor builds up. I start blogging in my head and decide that I'm going to call this a "cream and cookies" coolatta because the cream flavor is so overpowering. The sweetness is starting to get to me. I don't know if it's artificial or just too strong.... yet I continue on. I do love trying new coolattas and I'd at least like to make it through the whole thing when I try one (a small 16oz size that is). Ok, the cream flavor is becoming too much. I try to eat a couple pretzels but it's too late. Oh man, I'm gonna hurl.... quick: try something not salty... not working.... quick, open a window.... not working... try some minty gum.... oh man, so much traffic - so much urge to hurl...debating pulling over --- ok, I'll stop. Why did I share this terrible story? I don't know, because I had to? I felt compelled too? I think the lady was suppose to do -1- squirt of cream* and -3- scoops of Oreo, not 3 squirts and 3 scoops. Oh man did my stomach pay the price. Even 4 hours later, I still feel kinda wonky (though much better than I did immediately after). So, I understand that this was probably just a fluke, but be careful. I may think young, but man my system couldn't handle the sugary creme overload. Sorry, I couldn't resist but show you what it looks like after it sits for a few hours. My wife and I have always been very much in tune with each other. People think we are joking, but here's a great example. While I was buying my Oreo Coolatta (without her knowledge), she was busy bringing me home a slice of Oreo Stack from Barnes and Noble. I had a few bites and it's very tasty though unfortunately I don't have the stomach to finish it at the moment. *Dubba's Note: We've had a few people check and they definitely messed up my coolatta. I just want to clarify that a lot of people are enjoying this brand new 2012 coolatta and I'm guessing I will too next time. I'm just going to pay close attention next time they make it. Dubba's 2014 Note: I never went back for the coolatta in 2012, I was glad it was missing in 2013, and now that it's back in 2014, well, I'm still scarred enough not to try it. That said, I did just eat an Oreo Creme Donut and that was pretty good with all of it's fluffy white filling inside.... I just got it with a strawberry coolatta to be safe. Sorry to hear about your experience, but I'm sure it'll be better next time! 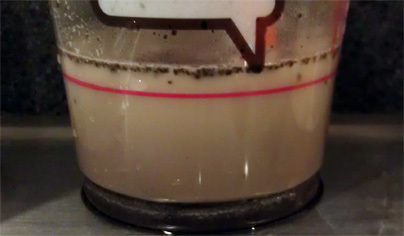 Supposed to be Cream,(or Milk) (Portioned to the appropriate size drink, 2 , 3 or 4 Pumps of Vanilla Bean Base, Or the appropriate measure of coffee base), 2, 3 or 4 scoops of cookie crumb and then Neutral Base, Blend. Sounds like they definitely did not know what they were doing. Eww! Sure hope you're feeling better now. I do, thanks for asking! thanks for the info, I'll update the post! hehehehe, we need a word that is stronger than sweet! this is like the gallon of whole milk challenge only with 16oz of cream instead. I can't say I've ever had something so sweet as to make me feel like vomiting, but I imagine straight cream would do the trick. it was in the span of just a few minutes while I was trying to finish the coolatta. I thought I was just overreacting a first, and then the nausea set in. I got a Coolata yesterday and mine was messed up to. It was just Oreo crumbs and water. No vanilla at all. I called my local Dunkin and am getting a free one. I don't think anyone's drink is getting messed up. I think it's just that bad. I ordered one yesterday because, well, I'M the actual biggest cookies and cream fan, and this was just horrible. I tried to force myself to drink it, but got through less than a quarter. The filled donut was mildly acceptable, but, it's a typical DD donut, which I'm not a fan of. I was just there--cause I love DD's iced coffee and egg-cheese-bacon bagel--and I was going to get the coffee one, but decided on the Iced Coffee cause they are hard to resist. I guess I won't get the oreo one, although I'm still a little tempted (uh, pandora's box!!!). On a brighter note, this blog has made me thirsty for a cookies-and-cream milkshake from Chick Fil-a. They did not make the coolatta properly. We have people that order our Vanilla Bean Oreo Coolattas all the time and love it. I personally enjoy the Coffee Oreo Coolatta. This has been well established, still doesn't change the fact I almost puked up mine. Don't worry, we still go to DD every week. I just got one today and it is sorta sweet when you get towards the middle of the drink (the first few sips are good like you said). What I'm planning to do is dilute it with 2% milk or unsweeted almond milk that I have to take away from the sweet. I got the Vanilla bean. Did you try that too or the coffee one? this was a poorly made vanilla bean oreo coolatta, I'm not a very big fan of coffee flavored anything. I am thinking about doing to try one. Are they really that bad? if you like sweet, and they make it right, you should be ok. Worst case scenario, you lose less than three bucks. I took 3 sips from the vanilla bean and poured the rest down the sink. Not because I didn't care for it, but because I'm trying to lose weight and a small is over 400 calories! Just wanted to satisfy my sweet tooth. Once I lose the 10 pounds I'm going to order the coffee flavored one and finish! yes, I am very familiar with Daym's awesome review of both coolattas at once (there is a link to it on my facebook page plus a comment by me commending him for it). after my terrible vanilla experience, and my displeasure of coffee flavored things, I'm the wrong person to comment on the other one.